So Josh and I were observing some really strange behaviour in the Keyman for iOS beta. When typing rapidly on the touch keyboard, we would sometimes get the wrong character emitted. We could not see anything immediately wrong in the code. So Josh added some logging. Then things got really weird: we would get the start of a touch event, then before the touch event handler finished, we’d get logging that indicated another touch event was received. Each message is processed completely before any other message is processed. This offers some nice properties when reasoning about your program, including the fact that whenever a function runs, it cannot be pre-empted and will run entirely before any other code runs (and can modify data the function manipulates). This differs from C, for instance, where if a function runs in a thread, it can be stopped at any point to run some other code in another thread. Here’s a fairly minimal repro. Load this up on your iPhone, and start rapidly touching the Whack div. You’ll probably need to use two fingers repeatedly to trigger the event (I can usually get it to happen with about 50-100 rapid touches). When it happens, you’ll get a log message with a call stack showing how the whackIt() function has apparently called itself! We’ll be reporting this to Apple… Just a heads up. 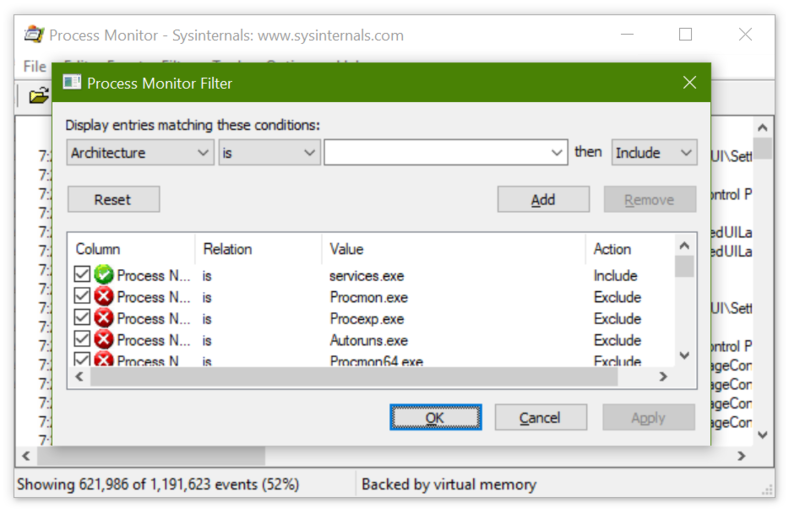 The other day, I was running a routine Process Monitor (Procmon) trace to debug an issue in Keyman, when I noticed something strange: over 50% of the events displayed with the default filter (which excludes a lot of system-level noise and procmon-related feedback) were coming from a single process: services.exe. You can see in the image below I’ve added services.exe to the filter (Process Name is services.exe), and then the status bar shows 52% of events belonging to it. Puzzled, I set aside some time to dig a little further (which means I went to bed late one evening). 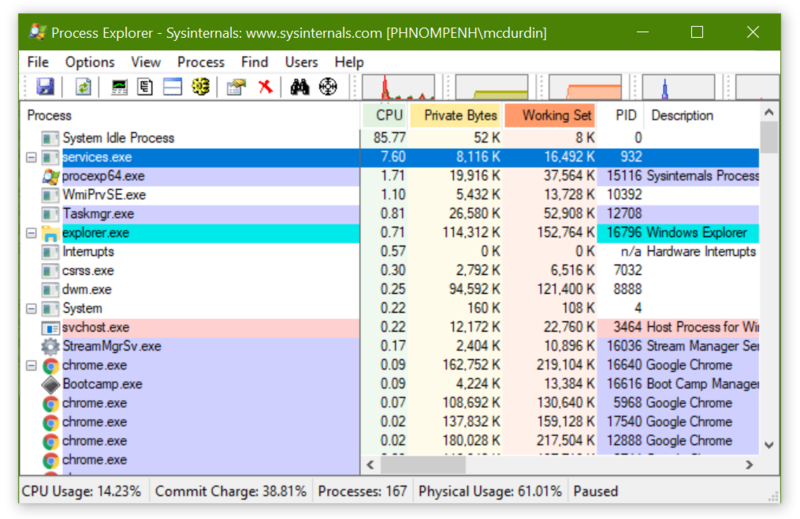 Watching Process Explorer, I could see that services.exe and wmiprvse.exe were between them consuming about 10% of my CPU. This did not seem normal. Nor did it seem to be a good thing for my battery life. 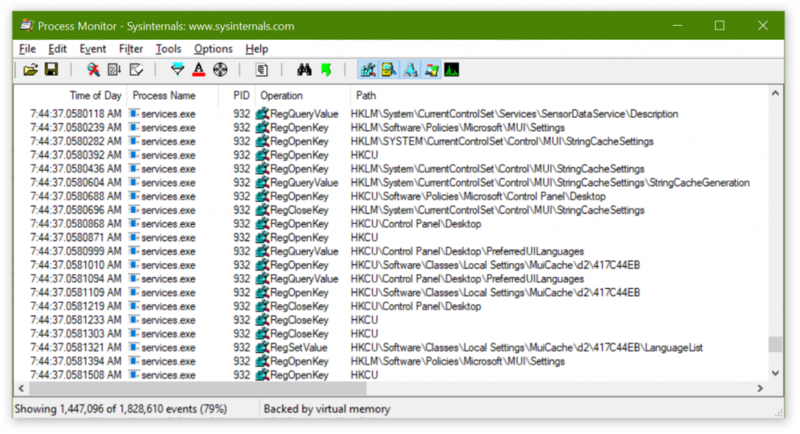 Deciding to examine the trace a little, I filtered out common registry keys and events, such as RegCloseKey, which made it easier to spot a pattern. 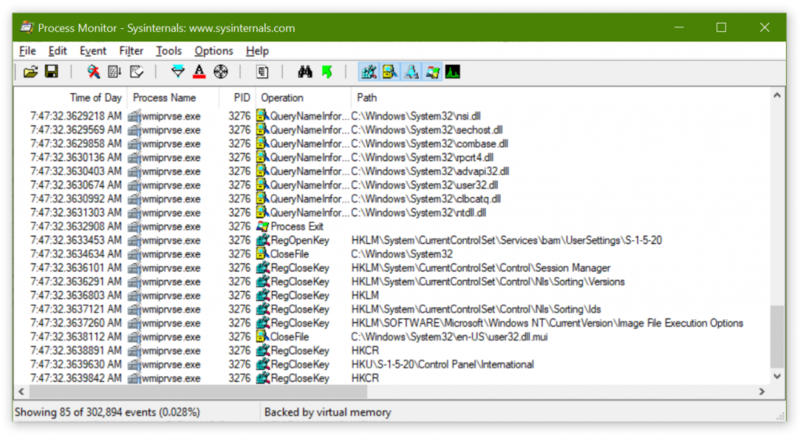 It became obvious that every 5 seconds, services.exe, with the help of wmiprvse.exe, would enumerate the list of services from the registry, sending about 120,000 events to the Procmon trace in the process. Nearly 80% of the events captured each minute by Procmon were generated by either services.exe or wmiprvse.exe! Nearly 80% of the events captured each minute by Procmon were generated by either services.exe or wmiprvse.exe! It was just a matter of figuring out which one. I started off by trying to dig into WMI logging. I don’t know if you’ve ever dug into that, but it’s huge, complex and somewhat impenetrable. It is likely that with the right knowledge I could have issued a command that gave me a list of queries being issued and who was issuing them. But I have not yet acquired that knowledge, sadly, and late at night my brain did not feel up to the attempt. It seemed easier to instead to use a process of elimination of processes (yeah, I did that on purpose). 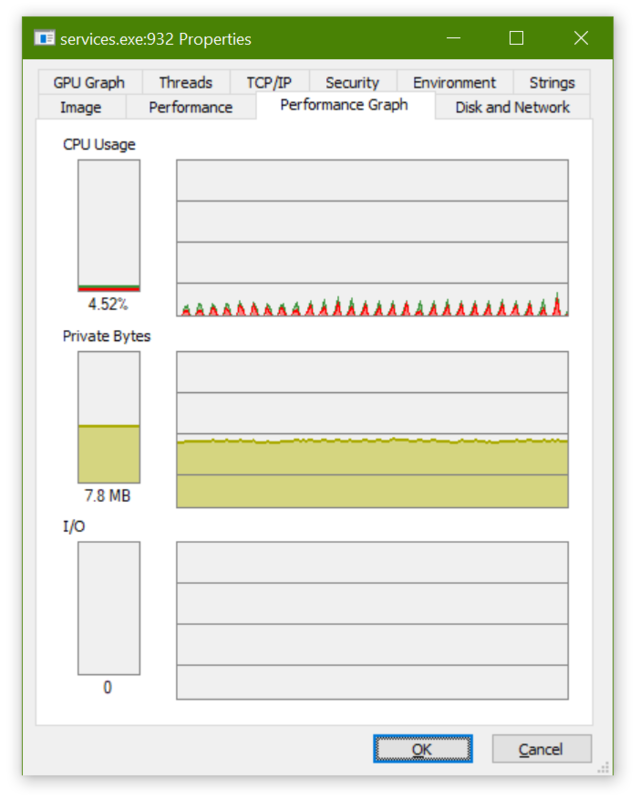 I started the CPU monitor in Process Explorer for the services.exe process, which showed lovely 5 second spikes. Then I started to stop various services, watching to see if the spiking stopped. It didn’t. Once I was down to a handful of critical services (do I really need to run the Firewall service?) I started looking at background user-level processes, such as the icons sitting in the System Notification Area. And here I hit gold. After shutting down a few, including my own programs, with no noticeable change, I shutdown MySQL Notifier 1.1.7. All of a sudden, CPU activity dropped to zero on the services.exe process, and the next Procmon trace showed a mere 85 events in a minute for the services.exe and wmiprvse.exe pair. I checked the MySQL Notifier forums and saw no discussion of this issue, but I found a closed bug report in the bug database. I’ll have to add my comment to the bug report. Once again, Procmon comes to the rescue 🙂 I’m looking forward to the increased battery life already! I was recently privileged to be a guest on Scott Hanselman’s Hanselminutes podcast. It was great to talk about the history of Keyman and how it solved real problems for us 20+ years ago. But afterwards I realised I hadn’t really described what sorts of problems Keyman solves today and why it is still relevant. So this post is that story. Note: I’ve put this on my personal blog rather than the Keyman blog because it’s full of my own personal opinions. There’s lots of useful content on the Keyman blog as well! A common story around venture capitalists and tech startups is that you have to have an amazing elevator pitch, the idea that within about 20-30 seconds, you can sell a problem and its solution to a person just begging to give you great wads of cash. And if you can’t describe the problem in 20 seconds then you probably don’t understand it yourself. With all due respect, that might be fine for selling package drones or IoT nerf guns, but there are plenty of hard problems out there that cannot be understood in 20 seconds. I think keyboard input for the world’s writing systems is one of those problems. For many people growing up with limited contact with Asian writing systems, they will look pretty and exotic. But that’s about the extent of it. So, let’s imagine you and I are in an elevator, and just as you ask me to explain the benefit of Keyman to you, the power goes out and the elevator lurches to a halt. Now you are stuck with me and I can give you the extended elevator pitch! Khmer is the national language of Cambodia, a small nation in South East Asia, home of one of the world’s ancient wonders, Angkor Wat. 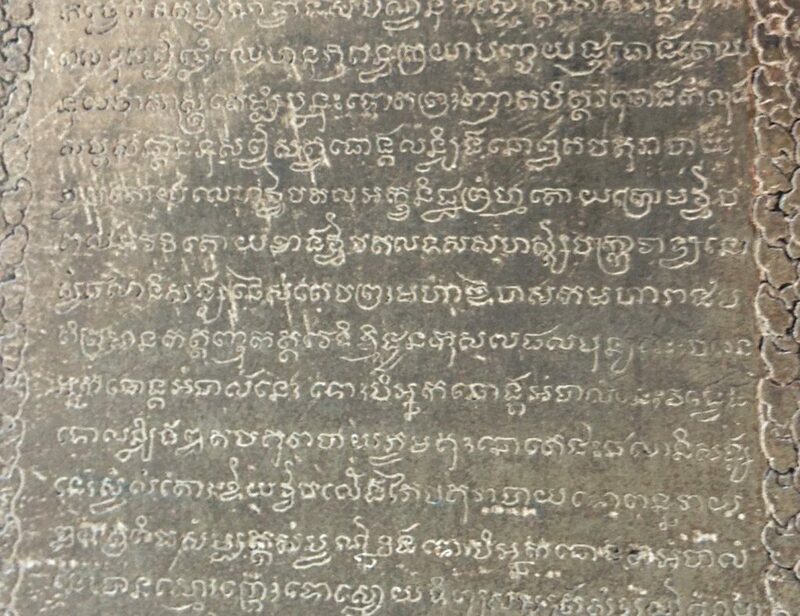 Here’s a couple of samples of Khmer text. 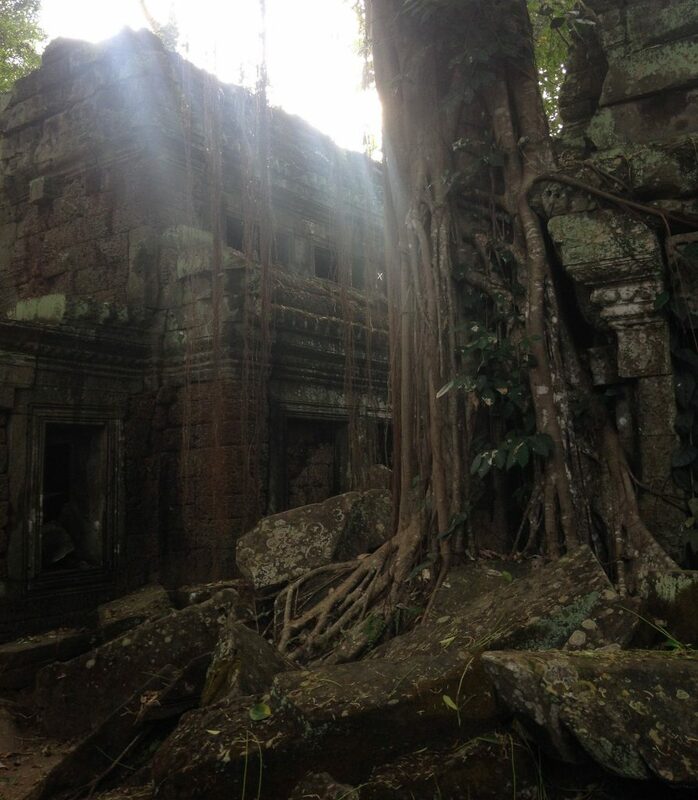 The first is a photo of an inscription from Angkor Wat. In a little bit, I’ll dig into how the writing system is used on computer. The script is beautiful, and it is complex, and it has a long and interesting history. But first, I would like to tell you a story. I recently learned about an effort by a group of Cambodian linguists to revise and prepare a new edition of a Khmer language dictionary. The current “gold standard” Khmer dictionary, compiled by Samdech Porthinhean Chuon Nath, has not been updated since 1967. So a new edition is very much needed. A number of different people have been involved in typing up entries for the dictionary. In the process, they discovered a problem: some entries which looked identical on screen were actually encoded differently in the computer. This meant that they were unable to consistently search for words, or even sort their dictionary correctly. How had this happened? This happened because it is possible to type Khmer words in a number of different ways and get identical output on the screen. And I don’t mean by using different input methods, either. I mean with the standard Khmer keyboard layouts supplied with all major operating systems, desktop and mobile. In this post, I won’t get too technical with lots of references to Unicode encodings. Instead, I’m trying to illustrate the issues from the point of view of a user, who shouldn’t need to worry about those details. 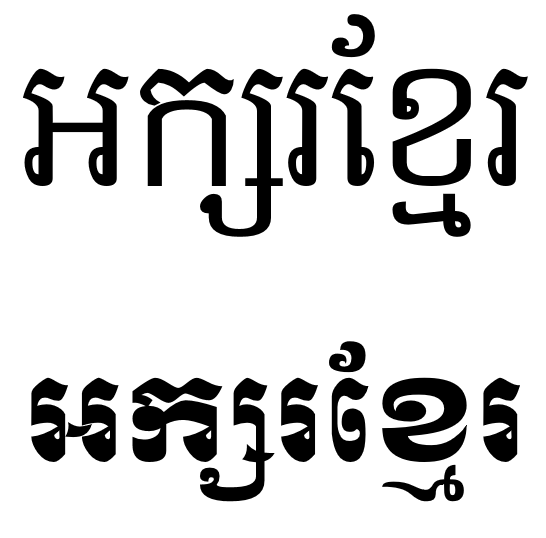 This is the word ខ្មែរ /kmae/, Khmer, which is the name of the language and the people. 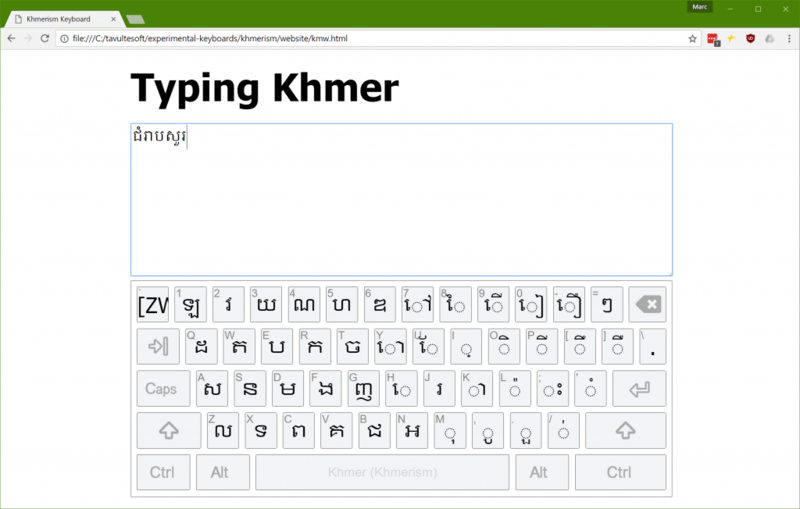 So, with the standard Khmer keyboard, how do you type this word? 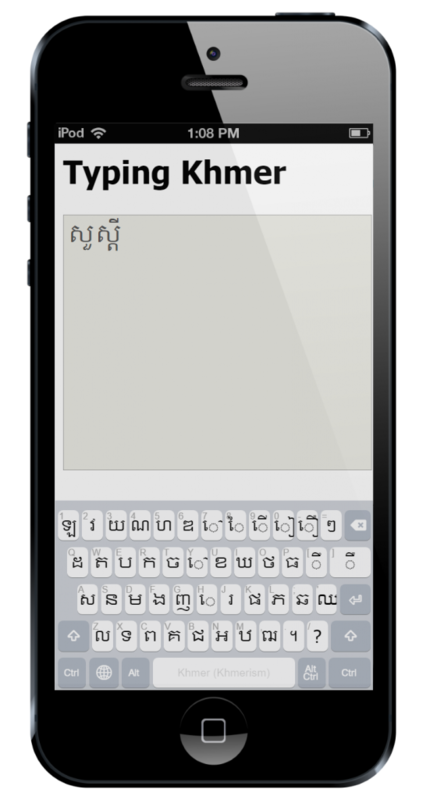 Let’s imagine you had this word on a piece of paper and a standard Khmer keyboard in front of you. We can tell that it’s made up of a group of characters and some sort of diacritic marks. Next we have the character and the diacritic mark. The first bit is easy enough to find, on the [X] key. Okay, that’s all very interesting but how does one type these cəəŋ consonants? 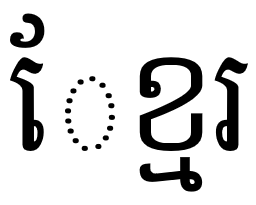 Well, the Unicode encoding standard added a special control character that’s not part of the writing system, called a KHMER SIGN COENG (U+17D2), just to support these letters. This is typed with a [J] key on the standard keyboard. Now we’re getting somewhere. So we’ll need to type [J] [M] to get that appearing under the . Now before we go any further, this magic sign is a problem. It’s a problem because now the user has to know something about the way their text is encoded in order to type it. It’s not a particularly hard thing to learn, but it isn’t obvious. And this is one of the easier things that a native Khmer speaker needs to learn in order to type their own language. The last letter is easy enough. Here it is on the [R] key. So the full sequence is: [SHIFT]+[E] [X] [J] [M] [R]. Let’s go ahead and type it. Ugh. Where did that dotted circle come from? The dotted circle is a visual hint. It tells us that the vowel is written before the consonant it is attached to, but that the encoding places it after. Okay, so let’s change it to [X] [SHIFT]+[E] [J] [M] [R]. Okay, that looks correct now. Well, okay, it looks fine … but it’s not. In order to meet the Unicode ordering rules, the vowel has to be placed after the entire consonant cluster, just as if it was spoken. Let’s go back and fix that again. Here’s our final sequence. [X] [J] [M] [SHIFT]+[E] [R]. This is the correct sequence. Now from a linguistic point of view most of this seems fairly logical, and it generally makes sense to users, once they learn it. But I hope this illustrates how some of these things are not obvious. If you haven’t been taught these rules, or if you do accidentally mis-type something, you won’t ever know about it. At first glance that doesn’t look a lot more complex, right? However, we’ve found 14 different ways to encode this in Unicode, all of which look correct on Android devices! And if you repeat diacritic marks, then you can expand that to over 35 different combinations, all displayed identically! My colleagues and I wrote a paper on the problem. Can you imagine searching an online dictionary with these kinds of problems? Now I know some of you are going to be saying that this isn’t a problem that is unique to Khmer. That it can be solved with post-processing and normalisation. And you are correct, this problem extends to many scripts. And some problems can be solved with normalisation. But I think Unicode normalisation is an appropriate solution only with correctly encoded data. Our goal is for data to be encoded correctly at the time it enters the system. You might argue that Autocorrect-type technologies could help with this, and they certainly can. But again, Autocorrect is really targeted at spelling and word completion, not avoiding encoding issues. (The inconsistently available implementations of Autocorrect don’t help either). Improved rendering engines could also give helpful visual feedback to users, alerting them to mistyped sequences. But none of these negate the importance of what Keyman brings to the party. So what does Keyman bring to this party? None of the system supplied Khmer keyboards make any attempt to quality control the input – generally they just output a single character for a single key. Given we have well defined, structured linguistic and encoding rules, we can leverage those in the input method and ensure that sequences that are invalid according to the specification just don’t make it into the text store. Keyman can automatically reorder and replace input as you type. 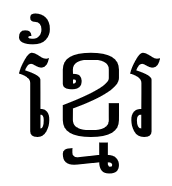 For our example, if you type a vowel before typing a KHMER COENG SIGN and a consonant, Keyman will transparently and instantly fix the order in your document, and you won’t even know. That, in a nutshell, is the power of Keyman. Keyman makes possible amazingly intuitive input for complex writing systems. Keyman is open source and completely free. Keyman keyboard layouts are defined with a clear and easy to understand keyboard grammar, so that anyone can write a keyboard layout for their language. The development tools include visual editors, interactive debuggers and automated testing to help you develop sophisticated keyboard layouts. Version 10 of Keyman is about to hit Beta. Would you like to be involved? Oh look, the power is back on. Elevator pitch over. Oh by the way, aren’t writing systems cool? Delphi’s T*Grid components have an annoying little feature whereby they will scroll the cell into view if you click on a partially visible cell at the right or the bottom of the window. Then, this couples with a timer that causes the scroll to continue as long as the mouse button is held down and the cell it is over is partially visible. This typically means that if a user clicks on a partially visible cell, they end up selecting a cell several rows or columns away from where they intended to click. In my view, this is a bug that should be fixed in Delphi. I’m not the only person who thinks this. I’ve reported it to Embarcadero at RSP-18542. In the meantime, here’s a little unit that works around the issue. so it should be checked if we upgrade to new version of Delphi. This functionality also surfaces in ITfInputProcessorProfileSubstituteLayout::GetSubstituteKeyboardLayout and ITfInputProcessorProfiles::SubstituteKeyboardLayout. From the minimal description in MSDN, this sounds like a feature that we want to use in Keyman Desktop (allowing us to, for instance, use kbdus.dll as a base layout for some Keyman keyboard layouts). However, we have been unable to get it to work. It seems the parameter type in the documentation is not quite right. This parameter is not a HKL that you can obtain from LoadKeyboardLayout or some such. Instead it needs to be a KLID, a keyboard layout ID, such as 0x00010409 for US Dvorak. Despite these restrictions, the RegisterProfile function does not check the validity of the parameter and happily tells you that the profile registered OK. While GetSubstituteKeyboardLayout returns the exact value that you registered, ITfInputProcessorProfileMgr::GetProfile returns 0 for the hklSubstitute member unless you meet the preconditions described above. Furthermore, hklSubstitute, when available, is not a HKL but a KLID. Finally, even after all this, it seems that the substitute keyboard layout does not apply. In fact, the feature is not that generic as you apparently expect. Its whole purpose was to enable smooth deprecation of IMM32 IMEs and their replacement (substitution) with TSF IMEs (aka TIPs). It doesn’t support substituting an arbitrary plain keyboard layout with another layout or IME (let alone of a different language). The hklSubstitute is supposed to be a real HKL, but for IMM32 IMEs it actually matches the IME’s KLID. There’s old verification code there which looks for a matching KLID in HKLM for a given hklSubstitute and ignores the latter if there’s no match. That’s why you get 0 from GetProfile for your invalid or unsupported hklSubstitute. Generic substitution was just never meant to be supported in TSF. It’s a shame, but we work with what we’ve got. So for Keyman Desktop 9, we wrote a mnemonic layout recompiler that recompiles a Keyman mnemonic layout keyboard, merging it with a given Windows system base layout, at keyboard installation time in Keyman Desktop. Henry bolted over to the girl, and stared at the screen, horrified, numbers pouring down its Retina display and mixed in the middle of it all, the dreaded words “acquiring node”. “Switch it off, switch it off, switch it off!” Henry tried to grab the iPad out of her hands and turn it off, which was probably not wise. “Hey, get off!” she yelled, and grabbed back. “Okay, okay!” She pressed the power button and the tablet screen flicked off. “No! That’s not enough, it’s gotta be powered down, now!” Henry cried. I left him to it, and looked around the café. There were only a handful of other students and staff there, but they were all using computers or phones or tablets, and they were all, every one of them, staring at their screens in consternation. I raced around and asked them – ordered them – to switch them off. Under a minute later, Henry and I met in the middle of the café. All the computers and phones and tablets were off. We were safe. Weren’t we? Henry and I looked at each other. I beat him to the counter. Scrolling down the cash register screen were, of course, the digits from hell, and as I watched, not one, but four “acquiring node” messages scrolled past, seeming to bump into each other in their hurry to make their way up and off the screen. I started to realise it was too late. Mechanically, I reached over and switched off the cash register, as everyone in the café watched. “Oh man, I am in so much trouble…” Henry, at a loss for once in his life, obediently followed me as I ran, leaping up the stairs and diving through the shortcut behind the Engineering department (even in this crisis, my mind briefly flicked over to Jenny – she smiled at me last night! ), and arrived, out of breath at the IT building just as an IT tech was making his early way into the building. I realised I knew him, slightly, through interactions in the PC labs when the lab computers inevitably went down. But I couldn’t remember his name. “You’ve got to switch off the campus WiFi, like, right now,” I panted. “What? Don’t be silly! Why would we need to do that?” he prevaricated. “Just pull out your phone,” I said. Sure enough, the phone’s screen was filled with numbers. “It’s a virus,” I explained, “and it’s spreading rapidly!” I thought that more detailed and accurate explanations could wait, though Henry stared at me, aghast, when I said the word “virus”. I caught the words “It’s not a virus, it’s a worm…” muttered under his breath. But that was enough to convince the tech. Gerald, that was his name. Together, we ran to the network management centre, burst in, and stopped, horrified. Every screen in the room was filled with numbers, scrolling past faster than we could read. And of course, “acquiring node”. As I looked, I saw one computer that seemed to be spending most of its time acquiring nodes, and its screen was filled with the dreaded message, and only the occasional number, scrolling past faster than we could read. At this rate, the entire University network would be down in minutes. I just hoped the firewalls would stop Bang from escaping the University. But I was none too confident. Knowing Henry, he’d probably designed in a firewall bridging routine. He always did create perfect code and account for every possibility. Okay, almost every possibility. He missed a big one this time, I thought ironically. He pulled out his Samsung phone, stared at the numbers marching across its screen, and tossed it aside. “Here’s hoping the PABX is still going,” he muttered. Picking up a nearby handset, his shoulders slumped with relief when he heard a dial tone. Immediately, Gerald speed-dialed the head of Campus IT. “Better try and bring in the professors, I reckon. This is going to take some big brains to solve,” I suggested. He stalked out of the room. Henry looked up at me. He was just as green as before. “I think I’ve broken the Internet,” he whispered. Moments later, Gerald strode back into the room, followed by his boss, who’d turned up with his tie unfastened and his shirt half buttoned. Clearly Gerald had been able to impress a sense of urgency upon him. He too stopped dead in the entrance, staring at the Network Operation Centre’s various computer screens, all filled with rapidly scrolling numbers, except that one that was filled with rapidly scrolling “acquiring node”. I was really starting to hate that phrase. “I don’t have time for this,” cried Head of IT, “What I want to know is how are we going to fix this? Have you quarantined the network?” This last to Gerald. Yeah, okay, Henry did sound a bit weaselly that time. “Yes, fibre links are disconnected, WiFi has been shut down, it should be contained, sir,” responded Gerald immediately. Henry felt obliged to pipe up again. “Technically, sir, it’s not a virus, because it isn’t attaching to other executable files, but rather is more like a worm, a bit like the Morris worm from 1988 …” I remembered the Morris worm, unleashed on a young and unsuspecting Internet by a less-than-cautious graduate student. Thinking back to the Computer History class from the previous year, I could see that Bang bore some distinct similarities. I just hoped Bang wouldn’t infect 10% of the world’s computers! More worrying to me was the fact that the fact that the creator of the worm, Robert Morris, was prosecuted for releasing the worm. But there’d be time to stress over that later. Henry was continuing, “It continues on by piggybacking on the TCP handshake when connection is established.” Which made no sense to me. I should probably remind you that I am going on my own memory here, and I’ve probably got the technical details all wrong. It was complicated, anyway. As Henry spoke, the NOC telephone rang. Gerald grabbed it. It was the University Vice Chancellor, calling because not only could he not use his mobile phone, or his desktop computer, but his car had stalled, on the street, on the way into the University, with the same horrid numbers scrolling up the multifunction display in the car. In fact, he was calling on his wife’s ancient Nokia phone which she refused to give up and which to him was looking a more attractive device by the second. Henry and I looked at each other. If Bang had made it onto his car computer, it was definitely out in the wild. From there, a tidal wave of events took us, and flung us headlong across the pages of history, all in one fateful morning. A television was wheeled into the NOC, and we watched a harried presenter in a makeshift studio (their normal studio computers had crashed, of course) report one network after another succumbing to Bang. Henry watched, silently. It was clear that he’d recovered a bit, because he was no longer green, more of a 1984 Mac white. He was also clearly thinking. I watched, also silently, as events unfolded, like a train wreck, too horrible to look away from. Airports were shut down. The stock market was offline. While some telephones were still working, and most power networks were still up, the companies responsible for those systems were unable to perform even the most basic tasks. All around the world, computers were busy calculating Henry’s fantastic factorial. For the third time, Henry started to explain. “It piggybacks off the SYN packet during the handshake, and … “ and my eyes glazed over, again. To be honest, I wasn’t sure I wanted to know how it replicated. The less I knew, the better. “… and the program uses a distributed parallel multiplication algorithm to calculate the next factor, based on the work by Bunimov in 2003.” Henry paused and looked at Professor Eisenfaktor. “And anyway, the end of the story is because the program is self-healing, I managed to overlook the fact that it has no way to stop it short of turning off the computer and disconnecting from the network so it cannot be reinstated,” finished Henry. “Precisely,” retorted Professor Eisenfaktor, “and I think you underestimate young Henry here. How long has that flaw in the protocols been there? Decades! And in one evening, Henry, purely in the interests of furthering his, if I may say so, extraordinary algorithm project, has not only identified this flaw, but perfectly and precisely utilised it in the creation of this wondrously beautiful replicating worm, what was it called? Bang? What a clever pun!” The Professor was obviously getting a bit excited, and even I was starting to get the idea that what Henry had created was, indeed, extraordinary, both in its technical beauty, and in the way it so effortlessly overwhelmed the entire planet’s computing infrastructure. “No doubt Henry has a suggestion?” the Professor finished, looking at Henry quizzically. “Well, actually,” started Henry, uncharacteristically but perhaps unsurprisingly diffidently, “I do. I believe I can create a program that follows Bang, in its footsteps as it were, and both kills Bang on each system it encounters, and closes the hole in the protocol at the same time.” He paused. “Go on,” the Vice Chancellor prompted. Henry and I stood. I glanced at the television. The President of the United States was now on screen, talking about the crisis, although we could not hear him as the sound was muted. I gulped. Well, if Henry hadn’t been noticed when was growing up, he’d certainly be noticed now. I’d probably end up notorious as well. I wondered if we’d both go to jail, or worse. The entire world was grinding to a halt. Banks had closed their doors. Supermarkets were not admitting customers. Leaders were telling their populace to stay at home and prepare for disaster. And yet, despite this, some phones were still working, and we still had electricity. I didn’t know what would happen if the power went out. I wasn’t sure Henry had enough juice to finish his Crash program. I’m sure you know the rest. Henry went on to write Crash, even faster than he’d written Bang, and the Vice Chancellor himself held off the police until he’d finished. Solemnly, Henry turned on his WiFi, Gerald switched the Campus WiFi back on, and we watched, entranced, as one after another, the numbers flicked off screens, replaced briefly by a smiling face – Henry thought it appropriate – before restoring the computer, tablet or phone to its usual duties. One by one, networks around the world restored themselves. And in the process, the security hole in the protocol was patched, automatically. And then the Federal Police asked Henry, and I (poor innocent I) to please come with them for a little chat. All’s well that ends well. Henry is now pretty famous, and some of it has even rubbed off on me, though I don’t think I deserve it. Although many clamoured for a prison sentence, Henry escaped conviction, because, as his lawyer said, it was a simple bug and anyone could see he didn’t have a malicious bone in his body. But Henry and I were both banned from the Uni’s labs for the rest of the semester, which I thought was quite unfair, given I hadn’t done anything. Henry was mostly disappointed that in the rush he didn’t find out what factorial result Bang had reached before being shut down. But then as he said, even if he knew the answer, it’s not like we could have recorded it anywhere for posterity. Not without using all the computers in all the world. A couple of days ago I helped some developers put together a very basic web page that uses KeymanWeb to showcase their keyboard layout. The idea is that a visitor to the page will immediately be able to try out their keyboard layout without any fiddling around. Another requirement was that the page work well on desktop and mobile devices. This requires a few little tricks, mostly because KeymanWeb has some special requirements to work smoothly on mobiles and tablets. I’ve presented snippets of the code, in the order they appear in the document. And here are screenshots just for posterity. At the time of writing, KeymanWeb (build 408) requires the viewport meta tag in order to render correctly on a variety of devices. Both clauses in the content attribute are required, and the keyboard will not scale correctly without them. Next, I add a link to the stylesheet for the on screen keyboard. This is optional, because KeymanWeb will inject the link itself anyway, but it does prevent a Flash Of Unstyled Content. I throw in some basic styling for the desktop and touch devices. You’ll see a selector of body.is-desktop on a couple of the style selectors. I use this instead of a @media query because this is differentiating between viewport-controlled devices and plain old boring desktop browsers. There may be a better way of doing this now, but I haven’t found it yet. The code for setting the is-desktop class is found further on in this post. I need to talk a bit more about the On Screen Keyboard (OSK) styling. While I could use the default styling (as shown below), this looks a little dated and I wanted to show how the keyboard could be styled as you like. There is some complexity to the OSK styling as it has many moving parts, around sizing, scaling and positioning of each individual key. I don’t want to throw away that baby, so instead I keep all the bathwater and just add some bubbles to jazz up the display the way I want it. That’s a mixed metaphor, but it was late when I wrote this. First, this CSS rule-set removes the thick red border and dark background, and adjusts the padding around the sides to compensate. Next, I hide the header and footer for the OSK. I don’t need them for this demo. I tweak the spacing between keys and rows and make the keys slightly less rounded. And that’s it for the CSS changes. It’s really pretty easy to restyle the keyboard without losing the benefits of a scalable, cross-platform keyboard. You’ll note that sneaky .desktop selector creeping in there. That’s because I’ve opted to style only the desktop keyboard; the touch layouts are already pretty nice and I’ll keep them as is. I load the KeymanWeb code from the KeymanWeb CDN. You can load from the KeymanWeb CDN (running on Azure) or keep a locally hosted copy, of course. I’ve commented out the source version and because we have only a single keyboard, I have elected not to include a menu for switching languages. Now, no self-respecting web developer is going to include inline script, except in a Hello World demo. So let’s call this the KeymanWeb Hello World demo, so I can keep my self respect. Or something. I use a simple page load listener. You could use an earlier listener, such as DOMContentLoaded, but window.onload has a rich and nearly honourable history. // This should really be in a separate file. Next some voodoo. Allows me to style the touch and desktop versions differently, as I touched on earlier. Why? Because KeymanWeb works very differently on touch devices. If you think about this, it must be so. A touch device has its own soft keyboard, which KeymanWeb must, by slightly convoluted means, hide, and replace with its own soft keyboard. Whereas, on a desktop device, KeymanWeb can show a utility soft keyboard, but does most of its interaction by getting in there between the hardware keyboard and the input fields. Next, make sure KeymanWeb is initialised. If I don’t do this myself, KeymanWeb will do so when things are ready, but I need KeymanWeb to be ready in order to load keyboards and attach events, and so on. I could add another keyboard, or a stock keyboard from the repository. I haven’t, but this shows you how. In this case, I have a custom keyboard, developed by Lyheng Phuoy. This is an early beta version of the keyboard but already it’s very impressive. In this section, I want to control the size, position and flexibility of the keyboard. I don’t want it to be resizable or movable. So I set nomove and nosize accordingly. Finally, in the body element, I set a special magic class, osk-always-visible, so that KeymanWeb doesn’t hide its on screen keyboard after displaying it the first time. And then we have basically the world’s simplest page with a textarea. And that’s it! I’d love to see what you do with KeymanWeb on your own sites. Here’s the full keyboard source, and that link to the demo page again, including Lyheng’s keyboard (with his permission). 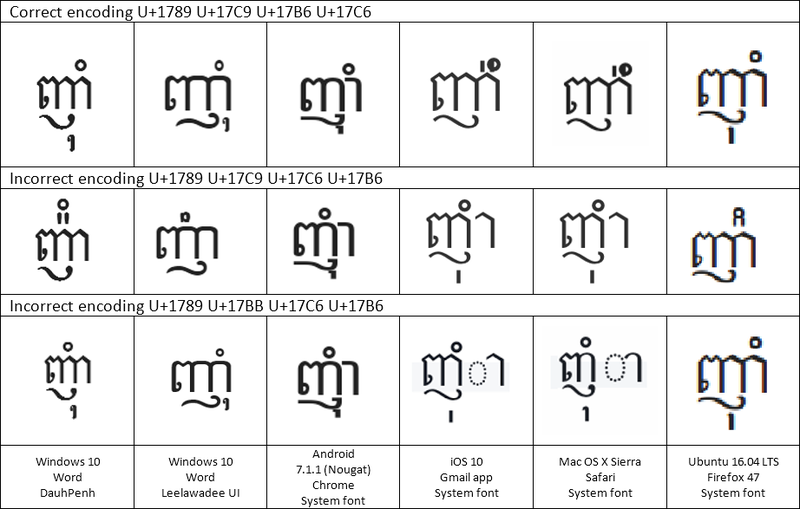 The Khmer script was added to the Unicode standard in September 1999. Today, nearly 18 years later, operating system renderers still get it wrong. This is a quick post to document the difference in how several Khmer words are wrongly rendered on different current operating systems. I ran these tests on Windows 10 (10.0.14393), Android 7.1.1 Nougat, iOS 10.2.1, Mac OS X Sierra <> and Ubuntu 16.04 LTS with Firefox 47. The good news is that Windows 10 and Ubuntu passed all the tests (bar a font style issue with Leelawadee UI). Android passed nearly everything, except the bad encoding test. Now, admittedly, the rules around triisap (U+17CA) and muusikatoan (U+17C9) are very complex. The Unicode standard description covers most of the difficulties, but not all of them. Muusiaktoan is also sometimes called ធ្មេញកណ្ដុរ /tmɨɲ kɑndao/ – rat’s teeth, which is a fun name. On to the words. In every case, the DauhPenh rendering is correct. As of Mac OS X Sierra, /sii/ now displays correctly. But contrast with /ʔum/, /ʔom/ below. Note how Leelawadee UI renders this wrongly; but that is a font rather than a renderer bug. As of Mac OS X Sierra, /pəy/ now displays correctly. But contrast with /bii/ above! I’d like to pull out the word ញ៉ាំ for further analysis. Every operating system has some trouble with this word, because it could be encoded in several different ways. The correct way works on everything except iOS and Mac OS X. The incorrect encodings should really display wrongly, but none of the renderers complain about both invalid forms! 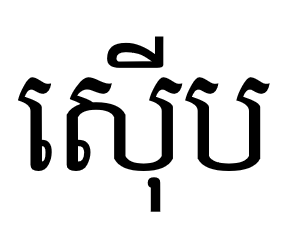 In this instance, The DauhPenh rendering is appropriate for the first and second lines; the Apple rendering is ironically most appropriate for the third line! Many thanks to Makara for his suggestion on the second incorrect rendering; I updated this post shortly after initial posting to include the extra example. There are other possible letter orders which may or may not display “correctly”; I will leave finding these as an exercise for the reader. Here’s one I’ll examine in detail another time. Some words can be written in two different ways, neither really incorrect. The Unicode standard caters for these by allowing for insertion of a Zero Width Non Joiner (U+200C) to force the superscripted form of triisap (៊) or muusikatoan (៉). Windows 10’s Leelawadee UI font gets this one wrong (but its DauhPenh font doesn’t). Note: table ZWNJ character order corrected as per comment by Olivier Berten.